Red banners flew high in the skies - upon the red background was the image of a bear, strong and proud. They belonged to a Legion of Aquilonian soldiers led by Legatus Legionis Valerius Sextia, the colours of his House became the colours of his Legion, to him his Legion was part of his House. At the border between the Pictish Wilds and Aquilonia, did his Legion camp, a large fortified military camp stood tall and with a trench dug around the wall so that none could climb into the camp, the Legion was camped near the border as word of a Pictish force was moving to raid but they will not meet civilians but professional soldiers, the Bear Legion was large, a grand force of men and horses; well trained soldiers and followed the will of Valerius...no matter how brutal it was towards their enemies. A remorseless man in the eyes of many who did not serve under him, even them in his House knew he was a cold-hearted man, they knew he didn't know what mercy was. On a silent yet warm day, the drums of war finally sounded as appearing from the woodlands was an army of Picts. The guards on the towers in the camp rang out the bells to alarm the Legion of the arrival of their enemies and without question, legionnaires ran to prepare themselves for battle, they lined the walls, watching with a lust to spill blood. The gates of the camp swung open as a horde of cohorts appeared standing infront of the ditch that was dug. Each cohort was in their respective area and their Centurions ensuring the cohorts were in proper formation yet the bloodlust was too strong for Valerius, his order was clear and simple that the archers upon the walls rained arrows down upon the Picts after they rained arrows back, men fell on both sides from the arrows. Upon a large brown horse, through the ranks Valerius rode to meet the Picts head on, following behind was others upon horses while the cohorts of men moved forward with their shields above them, infront and to their sides while the Picts charged forward themselves, a bloody and utterly violent battle was ahead. The cavaly Valerius led soon clashed with the Picts, some horses been impaled by spears and their riders thrown off and some Picts been sliced open by the rider's sword or broken bones from been knocked by the horse itself. Soon they clashed with the cohorts in the turtle formation which broke, both sides fought, outside the camp, blood was already turning the grass red and the ditch filling with blood mixing with the water at the bottom. 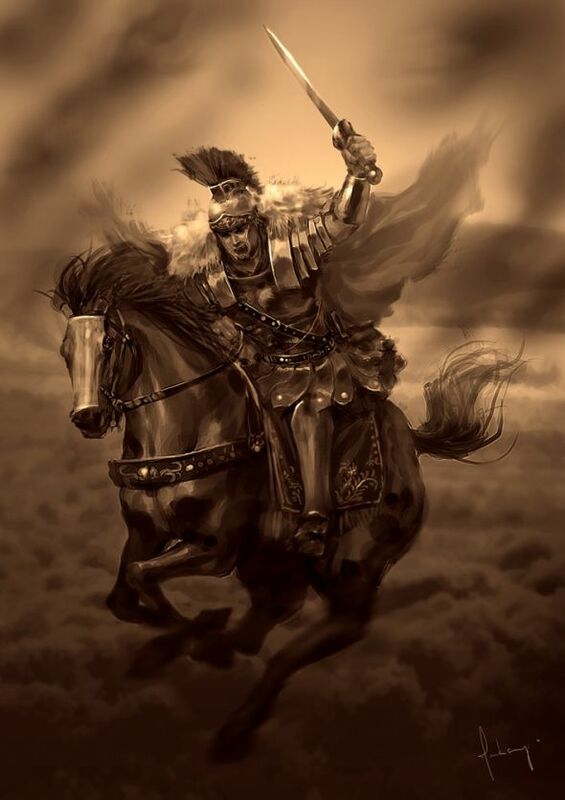 Valerius himself was thick in battle, slaughtering any Pict who met him in battle yet even he felt the piecering pain of a Pictist's spear going into his leg which caused him to roar out in pain before he turned to its wielder and slashed his sword into the man's head. He pulled the spear from his leg, turning his horse around and rides back to the dismount his steed. Only to pick up a shield which was been held by his servant, with it he marched back into battle, fighting along side his brothers. Hours passed as the battle kept on, so many dead on both sides, the smell of blood and death filled the air, it was clear the Picts were breaking as more of them fell yet no mercy was a rule the Legion followed, when the Picts ran the Legion's archers fired arrows to make sure more die. The cohorts formed back up infront of the camp was they ran, once the Picts had vanished back where they came from the Legion started to clear the dead, given their own proper burial rites while throwing the Picts into a mass grave in which they would burn the bodies while some of the Pictish bodies were nailed to crosses infront of the camp. More hours past till the clearing of bodies finished, darkness was setting in, Valerius was within his tent been tended too for his wound while legionnaires moured their fallen brothers still and the smell which was brought by the death will remain for days to come, small puddles of blood were gathered across the field of battle yet this was their duty, to kill their enemies and protect their homeland. As spoken by Valerius - either kill or be killed. "Ancient and Loyal Forever!" - Lord Viserion Velaenor of House Velaenor.